I have been looking for some closed back headphones for some time. 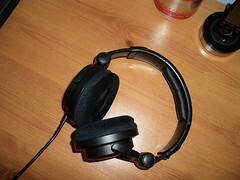 I used to use Sennheiser PX100 headphones, but that was mainly back in the old office with quieter or no air con. In the new office I am directly below the air con and open back doesn’t cut it. I was using CX300s for both commuting and office use. I don’t really like using the same units so often, as I am sure using plugs all day won’t do my ears any good. Soo I started trawling the interwebs for a set of hidden gems. Hidden gems are usually produced by a company trying to break through or sells mainly in another related field and applies that excellence to their accessories. The former would be Samsung pre or early LCD revolution. The later is KAM who specialise in DJ quipment. These folks know their stuff and seem to believe in their own brand. I heard about these headphones on Fake Headphones / Which Pair. I bought mine from Chemical Records the first pair were dead in one ear, Chemical were excellent and I ordered my replacement set from them. The sound is very nice, they tend to take on exactly what your MP3 player output, so no EQ shannigans.